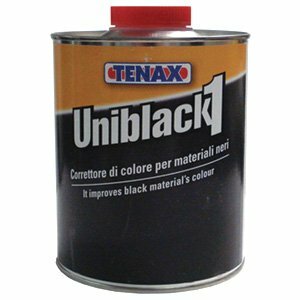 This product was designed by Tenax as a stain for black stone, especially Black Absolute. It stains the stone a deep black color that leaves the stone looking richer with increased clarity. This is an impregnating resin based stain and should be used as step one for correcting gray coloring on black stone. For step two get Uniblack 2. This product will not remove etching. To remove etching you need to repolish the stone, but if it is a poor grade of stone with calcium in it it may etch again. This is a HazMat (hazardous material). It can only be shipped via UPS Ground Delivery to the continental USA or UPS Standard Delivery to Canada. It is not able to be shipped via any other level of service or outside of the continental USA and Canada. Ships to CONTINENTAL U.S.A. and Canada only-- it is not available for delivery to Alaska or Hawaii. If you have any questions about this product by Tenax, contact us by completing and submitting the form below. If you are looking for a specif part number, please include it with your message. Superior LIGHTNING Instant Color Enhancement for Quartz 1 QT.